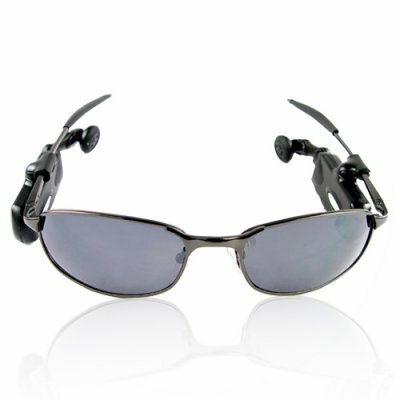 Successfully Added Sunglasses with 256MB MP3 Player and bluetooth Headset clip-on to your Shopping Cart. 256MB MP3 Player glasses attachment that supports MP3, WMA, and WAV. Easy fast connection via USB 2.0 (cable supplied) to PC. Plug and play, drag and drop music files from your computer to your headset music player. Internal rechargeable battery. Recharges from computer USB. Versatile Bluetooth Earpiece for handsfree calling on cellphones: clips on to any sunglasses or glasses. This lightweight, compact Bluetooth unit can convert your own choice of eyewear into a cool wireless gadget! The device comes with adapters to make sure it fits most glasses frame types, and can be used unattached as a normal Bluetooth earpiece. Compatible with all Bluetooth cellphones. English language user manual included in retail box..
Built-in rechargeable battery - standby time 100hrs.